Marital Aid Products, Adult Toys, Adult Furniture and Disposable Pleasure Items and More. Please kindly note adult toys and products award is a concealed category. Learn more about concealed awards. An adult toy is an object or device that is primarily used to facilitate human pleasure, aimed for people above legal age. The term adult toys also include apparatus and furniture for these purposes for additional pleasure and comfort. Wands, sticks, sleeves and suction devices are accepted. Since some of the products and devices to be submitted to this category interacts with human skin and interiors, extensive attention must be given to the safety and nontoxic nature of these products. Please note that, unlike other categories, submissions to this category could contain explicit images. Please kindly be reminded that such products could be illegal to use in some countries and they could be restricted through laws or religion, if this is the case for your country, please leave this page. 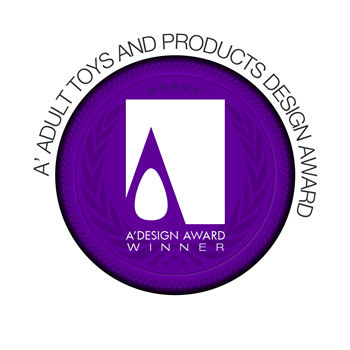 The A' Design Award for Adult Toys and Products Design is not just an award, it is the indicator of quality and perfection in design, the award is recognized worldwide and takes the attention of design oriented companies, professionals and interest groups. For realized designs, having the A' Award gives added value to your products and separates them from the rest of commoditized goods, it is an excuse to communicate your product to the media, a reason for press releases. Each winner design receives the trophy, receives a certificate and sticker templates to be attached to the products, the A' seal of design excellence is also included in the winners package, this seal is valid for the entire product lifecycle without yearly fees. Companies who wish to submit products to this category must also obey to the following addendum to the competition terms and conditions. A1. Even though the adult toy category is concealed entry due to the nature of products, the entries could potentially be visible online. Especially the following could potentially be visible to public: “Project name, category name, primary function, designer name, and small thumbnail image”. A4. You declare that the product is safe and nontoxic for human usage, even though if it is classified as a novelty product. If your product is discovered unsafe or toxic, your award status will be cancelled, and you agree to pay fines that are twenty-fold the nomination fees to A’ Design Awards, plus any other legal fees, plus any other fees or payments that might arise due to damages to people etc. When submitting to the Adult Toys and Products Design competition keep in mind that your submission will be evaluated on multiple dimensions, your product is judged together with its packaging, and if applicable maintenance/usage/application guide. Applicants should send high-resolution images of the product, together with a presentation of its packaging and application guides. The Adult Toys and Products Design award considers your submission on evaluation criteria such as: Innovation, uniqueness of the project, social impacts, environment friendliness, energy utilization, and project specific criteria. Most important criteria are highlighted as: Design, Engineering, Ergonomy and Presentation. To apply your product, packaging, design or service for the adult toys and products design award, simply register, login and upload your design regularly and choose Adult Design Award Category from the category list during nomination. Please note that even though this category is concealed by default, in some countries, entries could be visible to public. Learn more about the winners' benefits here. To learn more about winners' services here. And check the contents of the winners pack here. Please kindly note that some of the services will not be provided for this category. Award winners will be able to use a title that matches their nomination category: Such as "Adult Toys Design Award Winner". Previous winners for the Adult Toys and Products Design category are not publicly displayed, however further information and press kits could be available upon demand to press members and interested parties, please contact us for press kits in this category. Furthermore validation service is possible to confirm award status and qualification; please contact us to verify if a service or product is indeed a winner of the Adult Toys and Products Design Award. Main Image* 3600 x 3600 pixels JPEG High-Resolution clear shot or rendering, showing the work in a preferably white background , color or configuration options, preferably no explicit images. Optional Image #1 1800 x 1800 pixels JPEG A Shot or rendering of the work with a composition of the same work showing different material, color or configuration options, preferably no explicit images. Optional Image #3 1800 x 1800 pixels JPEG A Shot or rendering showing a detailed view of the product or focusing on a unique feature, explosion, layered or sectional views if required or alternatively showing the product with a model, but not an explicit image.